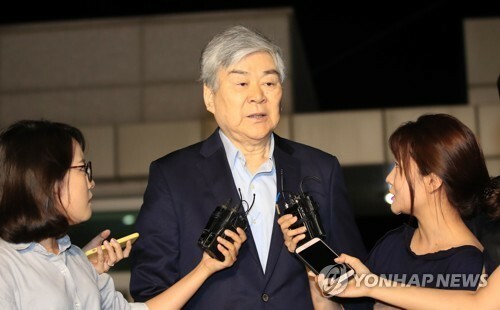 The nation’s antitrust watchdog said Monday it decided to report Cho Yang-ho, chairman of Hanjin Group, to prosecutors over alleged unfair business practices, adding another allegation to the chief already accused of tax evasion and embezzlement by prosecutors. The Fair Trade Commission said the Korean conglomerate that owns Korean Air and Hanjin Shipping omitted to report its four affiliates run by Cho’s family members as well as the names of 62 family members to the FTC from 2003 to 2018, with the alleged intention of evading regulations and reaping benefits. Due to the omission, the four companies were regarded as small and midsized firms instead of affiliates of conglomerates, the FTC said. They were therefore not subject to fair trade laws that regulate owner families of conglomerates, unfairly reaping government benefits given to small and midsized companies, the watchdog said. According to the FTC, the Hanjin chief was aware of the omission as he had signed related documents reported to the FTC. The four affiliates in question are Taeil Trading, Taeil Catering, Chungwon Coldstorage and Wac International Logistics, with majority stakes owned by the family members of Cho’s wife, Lee Myung-hee. The companies have supplied goods related to air cabins to Korean Air and Jin Air. Taeil Trading has been supplying products such as airplane blankets and in-flight slippers to Korean Air since 1984. Taeil Catering has been providing food ingredients for in-flight meals since 1997. If Cho is found guilty, he could be jailed for up to two years or face a fine of 150 million won ($130,000), according to the antitrust watchdog. The Hanjin chairman is already under investigation by prosecutors over several allegations including tax evasion and embezzlement. Cho has been accused of evading inheritance tax of around 50 billion won in the process of taking over assets from his father and Hanjin founder, Cho Choong-hoon. Cho and his family members are also under investigation over allegations that they used embezzled money to buy shares for management succession. The investigative agency said it found evidence that Cho’s family embezzled money by forcing its affiliates to pay transit duties to a broker firm run by Cho’s family when supplying tax-free items on board to Korean Air.